Brown ale with a bit of a bite, nice crisp roast grain bitterness on the finish. Dark brown, but clear, with tight beige head, good lacing. Aroma is roast grains and hint of molasses. Taste is mostly roast grains, burnt toast, wood. One of the better brown ales I’ve tried. It pours a deep brown color. The body is a dark brown with a light cream colored head with some nice thick ringy lacing. The smell is all about the nuts and roasty chocolates with some slight caramels backing that up. A bit of brown sugar comes in with the hops telling you that this is a beer. The taste is superb with a roasty, sweet, malty, caramel, chocolate flavor. The nuttiness powers through into the taste. The palate is about a medium with a great balance between wet and dry around the tongue. It is very smooth and creamy, just like any Brown should be. Overall, this is one of my all time favorite brown ales, English or American. 2015 bottle served in a goblet. Clear red-brown body with a large, foamy tan head that leaves a partial coat of lacing on the glass. Very good retention. This "double brown" is, thankfully, double the malt bill (I guess) but not double the ABV of a standard brown. Double hops too, I suspect. Certainly Americanized with enough hops to add flavor, bolster complexity, and leave this malt bomb leaning slightly more towards bitter than sweet. A: Dark brown with an amber tinge, cloudy, some bubbles clinging to the inside of the glass, 4 fingers of beige chunky head. Large and small bubbles in this devolving head. S: Chocolate, molasses, brown sugar, malt, alcohol, a little citrus. T: Brown sugar, molasses, malt, malty malt drink, did I mention malt? Some hints of chocolate. M: Medium thick syrupy body, little carbonation. O: Excellent brew. 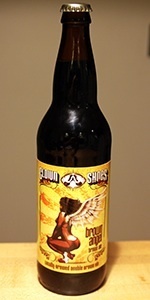 A double brown ale. Is it the best I’ve had as many say? No, but really well done brew. Bought in Grand Rapids, MI, drank in Kalamazoo, MI Aug 17th 2014. Personally this beer ins't one of my favorites. The appearance of the head is creamy and frothy, dark and lasting. The lacing was decent. Body cloudy, hazy, murky, and slightly muddy and dark brown. The aroma smelled of molasses, caramel, toffee and coffee. Light hops but a yeasty smell. Body was full, creamy with an alcohol taste. Very metallic after taste. I really enjoyed this beer because it is so smooth and easy to drink. This beer has a wonderful coffee and malty aroma to it and the taste has a great mix of hops, chocolate, nutty, and citrus. This beer has a great balance between bitterness and that full body nutty flavor. This beer has a dark brown color, almost looked like pepsi when poured out. It was foamy and had small bubbles as well. The smell was very light but full of flavor, I could pull out the hops in it. The taste was slightly bitter to me. I pulled out some light coffee flavors. It was a light tasting beer and overall good flavor. Aroma is like a bakery, fresh bread, rye/pumpernickel/sourdough. Appearance: dark brown, tan head. Looks delicious. Taste: caramel, some yeast, more Bread. Hint of raisin or some dark fruit. Very nice Feel is A little flat, muddy. Really nice brown ale. I’d buy this again. Looks like a cola with a 2-inch tan collar when poured. The head is creamy. Very nice nose with suggestions of hazel nuts, coddled cream, and candied almonds. Medium full body. Nice, long lingering with dried fruit and nutty notes. Definitely moreish. Slight residue of yeast allowing the last of the pour some cloudiness. Somewhat sweet, but nicely balanced with some hoppy bitterness. The hops are mostly subdued but play an important background role. Nice Belgian lace. It would be a pity if this beer indeed is retired, however, I just purchased it and I would buy this again! L- Pours a dark cola brown with a towering foamy 3 finger head. Lacing is copious and lasting. S- The nose is typical caramel malt sweetness without much hop characteristic. T- Caramel sweetness with a mild ashy bitter finish. Definitely a bit of oxidation going on here. F- The feel is light with a low prickly carbonation. O- This beer is probably past its prime, but still possesses some nice qualities of your typical brown ale. Nothing earth shattering.